See below the RUMA example of microfranchising. The business began operations in 2008 and has made good progress since. In the past decade cell phone production and use has skyrocketed. Even those in poor villages are able to acquire a cell phone, however, the problem they run into is paying for the air time and minutes. That is where RUMA comes in. RUMA gives franchises a mobile phone, marketing materials, training on business operations, working capital loans and mentoring services. They provide the franchisees with everything necessary to help them be successful. The microfranchises can then start selling airtime to members of their community. The most innovative characteristic of RUMA’s model is their ability to use the mobile phones themselves as the transaction mechanism. In 2008, Grameen Foundation helped found a local social business in Indonesia called RUMA, built on the emerging microfranchise model. 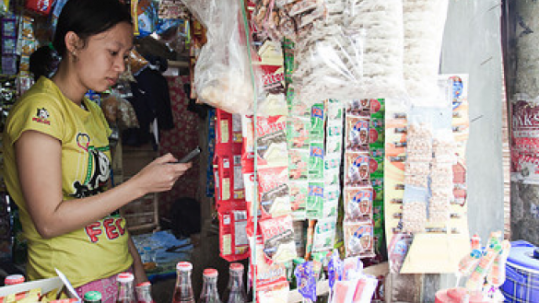 By building on existing mobile phone penetration, it is providing the inputs, capital and business guidance to help the poor develop micro-businesses around their mobile phone. RUMA stands for Rekan Usaha Mikro Anda, or “Your Micro business Partner.” RUMA provides its microfranchises with a “business-in-a-box,” which is a turn-key, pre-packaged business that helps them increase their incomes. As of the end of April, 2011, RUMA had a network of over 7,200 village phone operators serving 679,851 customers. They were growing at 6 percent per month and had plans to go even quicker. The organization has proven to be profitable and sustainable as it continues to grow, create jobs, and reach new markets. In 2014, it began expanding to East Java and Bali and already had 50 branches. RUMA is just one example of how microfranchising is helping tap into communities that are full of potential. It is showing the business community that investing in building up the poor can help open the floodgates of private dollars that are currently reserved for luxury, high-margin goods that are only serving the top one percent of the world. Famously called “Teh Yayat”, she is one of our most successful agents who lives in Cilegon. It had never crossed her mind that a small business she started from selling snacks and drinks could grow big and become her business today. When she started joining RUMA as an agent, she only had Rp500,000 (34,23€) as her working capital. She sold mobile credits and also served bill payments service to customers who were mostly her neighbours, and they trust Teh Yayat for she is a humble, welcoming, and genuine person. After couple of months, Teh Yayat profited from her payment business, and she used the money to grow her “warung” (a small stall selling snacks, drinks, groceries, and consumer daily products). Now, her weekly transactions can reach up to Rp16,000,000 in value from selling mobile credits and serving bill payments only. Teh Yayat believes the way she runs business is just like RUMA does it to its agents; she does it with care and wholeheartedly.